During 1928 and 1929 I built the transmitter and assisted Paul Carriger and a Mr. Freeman in the installation of the first television station ever installed in the South. This station used mechanical disk scanning and was operated from Castle Hill east of Shreveport, Louisiana. Pictures were received in Shreveport and at Kennonwood, 18 miles north of Shreveport, where extensive experiments were carried out on receivers. In June 1938, I was present and received instructions and briefing on one of the very first Iconoscope cameras in New York City. The cameras were set up in one of the RCA laboratories and the demonstrations were under the direction of Mr. "Stu" Seeley, who had at that time developed the bias light to correct the output curve of the Iconoscope tube. In May 1948, under my supervision, Radio Station KWKH filed application with the Federal Communications Commission for a television station on channel 8 to be operated in Shreveport. Prior to, and after this filing, intensive studies were made and all technical data was supplied to Mr. A. Earl Cullum, Jr., whose firm prepared and filed the engineering exhibit attached to the application. A thorough and complete study of all phases of television studio and transmitter installation, operation and maintenance was necessarily carried out in connection with the preparation of the application. These studies have been carried on during the past five years to keep abreast of developments. I have thoroughly studied all technical data supplied by RCA, General Electric and DuMont as well as other manufacturers and independent sources and publications. The studies have covered all available types of equipment, antennas, towers, transmitters, studio equipment, test apparatus, studio lighting, film and slide projection, film camera recording and special effects apparatus. I have attended four NARTB Engineering conferences, two in Los Angeles and two in Chicago. All phases of television engineering was covered in the papers delivered and all the latest TV equipment was shown. A study was made of all equipment shown and all engineering conferences were attended and all printed material available was collected for future reference. In 1949, experiments were conducted and research was carried out in connection with Tropospheric propagation of TV signals from WBAP-TV, Ft. Worth, Texas. These experiments were carried out at KWKH In Shreveport which is well beyond the theoretical fringe area. During 1949, I invented and developed a high gain broad band TV receiving antenna known as the TELESINE. On March 13, 1950 I filed for a patent on this antenna and the patent office number is SW 149353. In developing this antenna pictures were received from WBAP-TV, channel 5 at a distance of 200 miles. Similar reception was also had from Channel 8, Dallas, Texas. The reception of TV signals beyond the fringe areas caused the FCC to freeze the further action in granting TV stations throughout the country until the then existing allocation of channels could be reevaluated in the terms of practical propagation results. As an outgrowth of these discoveries, Mr. A. Earl Cullum, Jr., member of the Ad Hoc committee, asked Radio Station KWKH to commence the recording of tropospheric propagation of channels 4 and 8 signals from Dallas, Texas. In April 1951, two REL special receivers, types 726 and 727 were purchased by Radio Station KWKH along with two Esterline Angus 1 milliampere recorders. This equipment was installed and operated under my direction and has been in continuous operation since 1951. Data obtained from these recorders are forwarded to Mr. A. Earl Cullum, Jr. whose firm carries out an analysis of the measurements. The results of the analyses have been made available to the Federal Communications Commission and all others making studies relating to TV propagation. In 1949, through the efforts of the management of KWKH, a DuMont Telecruiser was brought to Shreveport and placed on exhibit at the "Home Show. This Telecruiser was completely equipped with two camera chains and all equipment necessary for a television closed circuit supplying video and audio to 30 - 40 television receivers. TV sets were installed and adjusted throughout the "Home Show and continuous demonstrations were carried on with live video pickups. This equipment was operated by Mr. Lou Pett and Mr. Meyers of DuMont. I assisted in the planning and setting up of this operation, which required considerable knowledge of TV receivers, distribution amplifiers, etc. In May, 1953, a complete course in overall television technical installation, operation and maintenance was had at WMPC, Memphis, Tenn. This technical course was given by and under the supervision of Mr. E. C. Frase, technical Director for WMCT. Mr. Trace was assisted in the course of instruction by Mr. Nelson Alquist and Mr. "Buddy" Frase, WMCT studio supervisor and crew chief respectively. This instruction covered all phases of a complete TV station operation from a technical standpoint, such as, microwave remote pickup, microwave studio-transmitter link circuits, studio film projection, studio cameras, sync generators, Telephone Company terminal equipment, studio lighting, film processing with a Houston film processor, film editing, cutting, splicing and storage, production of shows by use of film cameras and associated sound on film equipment, transmitting antennas, RCA TV transmitter, test apparatus, maintenance procedures, etc. The WMCT operation is closely comparable to the type of operation proposed by KWKH. In May, 1953, KWKH purchased and received a complete two camera (RCA TK 11A) portable field chain consisting of Sync generator, camera controls, stabililizing amplifiers, power supplies and a Monitran for a complete closed circuit operation. This equipment was installed and is being operated under my direction. 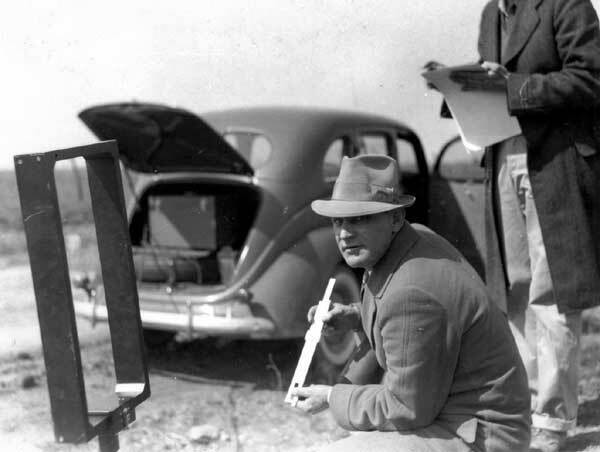 Immediately upon receipt of the field camera equipment and it's installation, the services of Mr. Nelson Alquist and Mr. "Buddy" Alquist, studio supervisor and crew chief, respectively, for WMCT, Memphis, Tenn., were secured and they wore brought to Shreveport to instruct KWKH technical personal in the operation and maintenance of the equipment. During the course of the closed circuit operations and the attendant equipment instructions, Mr. Alquist, one of the outstanding experts on studio equipment, stated that KWKH was making better quality pictures than he had seen elsewhere. Mr. Antony was also a pioneer in television and transmitted a television picture in 1927 from Beacon Hill [later known as Castle Hill], east of the city to Kennonwood, where the KWKH transmitter was then located. Using an antenna of his own invention, Mr. Antony transmitted a fairly clear and easily recognizable picture of Krazy Kat.